There’s no denying that skating is hard on your feet, which is why choosing the right shoes is important. You’ll want to consider quite a lot of factors before you just slap on any old trainer. 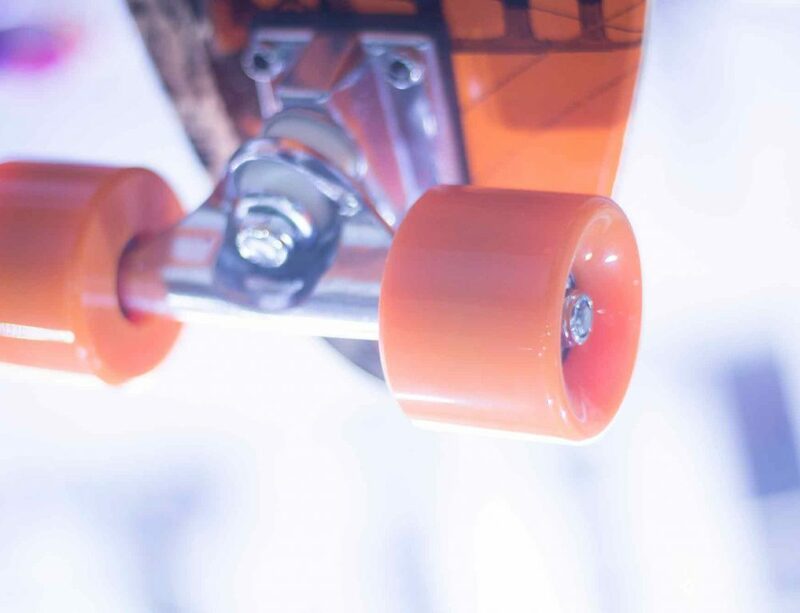 The way you skate, the quality of the materials, the comfort of the shoe itself, how much traction it offers, and how well it protects your toes, are all key factors in the best shoes. And that doesn’t even cover your budget and style preferences, which are both also important. We kicked our list of top skate shoes off with something that has a pretty classic skate shoe style. It is a bit slimmed down compared to the chunky Etnies you grew up with, but the Lakai Griffin still has that padded look for comfort and aesthetics. It’s also a very lightweight shoe, which is great for beginners, but don’t expect it to offer much more than that. It only meets the most basic of skating needs in terms of protection or support, and it also doesn’t offer a wide version for bigger feet. 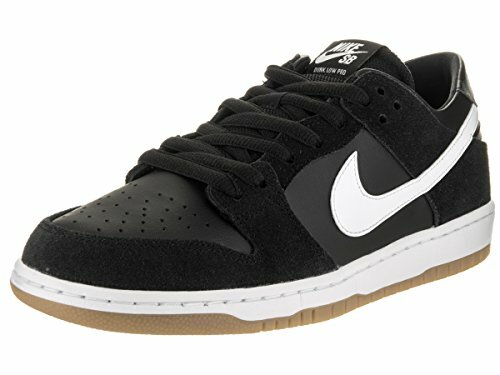 However, it’s a solid choice for a basic, every-day skate shoe at a lower price. If you’re looking for a more modern styling that will still work for wide feet, the Fallen DOA is a good place to start. But this shoe’s main draw is how structured it is. It offers a lot of stability for kicks and tricks, and the impact-absorbing padding makes skating much easier on your joints. Made of very durable leather, you can expect this shoe to give you a bit more in the way of weatherproofing as well. The only drawback that we can see is that it’s a heavier shoe, so it may take some time to get used to the added weight when doing tricks. If we had to pick one shoe off this list to showcase as the example of modern styling meets classic skate shoe features, it might be the Supra Stacks Vulc II. It’s got a sleeker profile with a casual look that modern riders want but includes impact resistant padding, arch support, nice flexibility, durable suede upper, and grippy tread. It also offers toe protection and padding around the heel and tongue for comfort. The only real issue is that it’s a low top, which means you might lose some ankle support if you prefer it. The Etnies brand is known primarily for comfort, usually offering a ton of padding and breathable mesh on all their shoes. The Jameson 2 Eco is just a little different. This one is made of recycled materials and is part of the company’s giving back program that plants trees around the world. 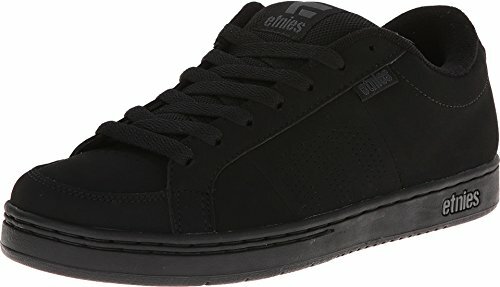 Beyond the eco-friendly design, though, this one doesn’t lose any of the comfort usually offered by an Etnies, even if it does have a sleeker design than the brand’s usual styles. It makes a great replacement for something like a classic Chuck Taylor – no bells and whistles, but a solid choice overall. However, one problem we found with this shoe is that the sizes can differ from a standard Etnies, so be sure to try before you buy. A quick glance at the DC Trase TX might not reveal anything special, but this sleeker skate shoe actually has a lot to offer. Like a lot of the more stylish options on the market today, this shoe can run pretty narrow, and is made of simple fabric, so it’s not quite as durable. But it does have a nice grippy tread and a rubber outsole to protect your toes, as well as metal eyelets for a bit more durability. It’s also got a lot of mobility compared to some of the meatier skate shoes out there. Styled like the classic Etnies sneakers that many skaters grew up with, the Kingpin is a chunky, well-padded shoe that features the brand’s signature breathable mesh for the most comfort. It also has a very grippy outsole for plenty of stability, perfect for skaters who are out there doing difficult tricks. 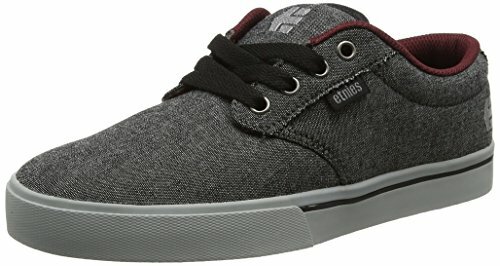 Etnies are known for being a little bit difficult to size on your first time, so it’s better to try these on before you buy. However, the brand has a great reputation for durability, so once you find the right shoe, you’ll typically be wearing them for years. Featuring one of the most robust toe caps on any shoe we reviewed, the HUF Classic Low is perfect for skaters who aren’t taking chances on foot injuries. In addition to the rubber toe cap, this shoe also has a heel counter, and grippy herringbone tread for stability. The low-top style is sleek and simple, with just enough padding for comfort, but not enough to get bulky. The shoe is made of durable leather that will keep your feet a bit drier than the standard canvas shoe. We kept comparing these shoes to a classic Chuck Taylor with a bit of a meatier toe cap, and what feels like better craftsmanship overall. But be aware that like that classic skate shoe staple, there’s no arch support in the HUF. 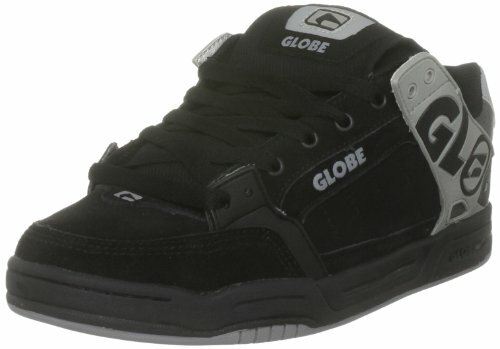 If you are looking for a puffy-tongue skate shoe with a more distinct focus on professional skating needs, the Globe Tilt makes the cut. This one features stabilizing laces, padding all the way around, tons of flexibility, and some serious grip. The leather material keeps your feet dry, and the insole helps absorb the shock from jumps and tricks. 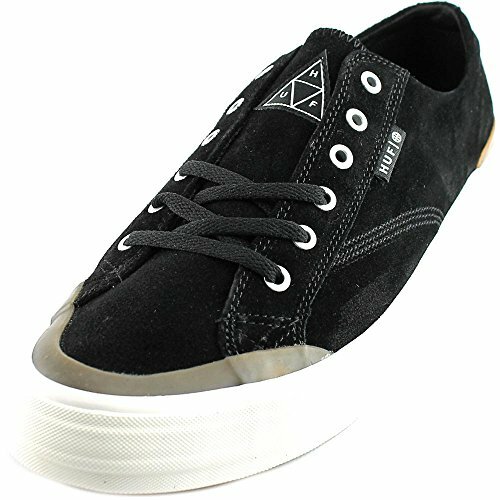 All in all, this is a shoe that is totally focused on supporting the act of skating, without attempting to be an all-around casual shoe. 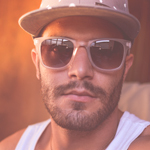 That doesn’t mean you can’t rock the style anywhere, but it lacks the modern sleekness that many of the others on this list boast. If we had to choose a second shoe on this list that combines modern styling with pro skater features, the NIKE SB Zoom Dunk Low could be it. Like the Supra Stacks, this shoe has a bit of a slimmer profile without sacrificing any padding around the collar and tongue area. It’s also got breathable mesh at the toe box and tongue for more comfort when riding. The midsole manages to be both lightweight and comfortable, something that we found difficult to find in the others on this list. 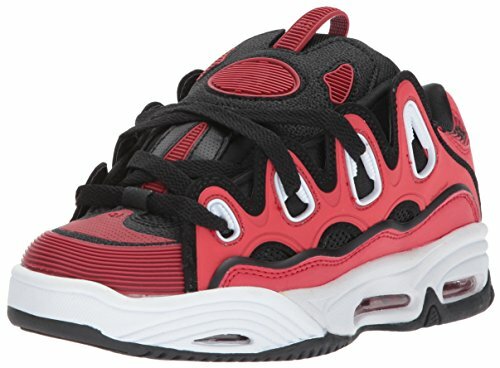 Unlike other puffy-tongue skate shoes, this one does offer some arch support, and the suede material of the shoe is nice and durable. 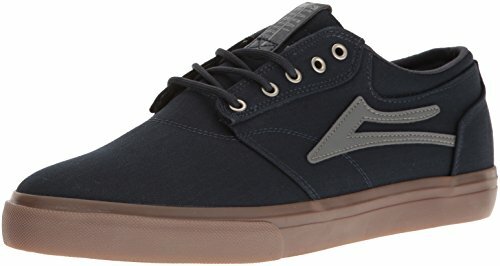 If you are looking for an athletic shoe that supports your skating, and don’t care about the aesthetics, this is your shoe. Made to last, this shoe features reinforced uppers, padded tongue and collar, abrasion-resistant toe protection, flexible arch, and tons of grip. The reinforced laces offer support to the sides of the feet and ankle, and the shoe comes in a ton of colors. This shoe is all about performance – just don’t expect to win any style competitions. 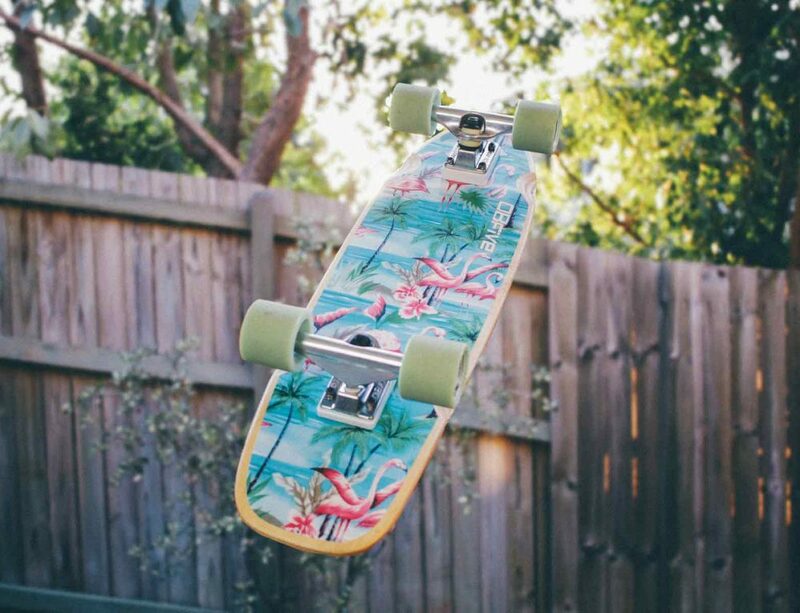 One thing that we found with many of the shoes on this list was a tendency to break down after a few months of heavy skating. So we went looking for a shoe that could really take a beating, and we found it in the DC Evan Smith. This shoe has a unique style, with a more visible rubber toe cap, contrasting colors, and high-top profile. The padding around the collar and tongue is slimmer but exaggerated by the quilted stitching. If you prefer to skate in something like a classic Converse, you’ll probably love the feel of these shoes, and they get major points for great durability. 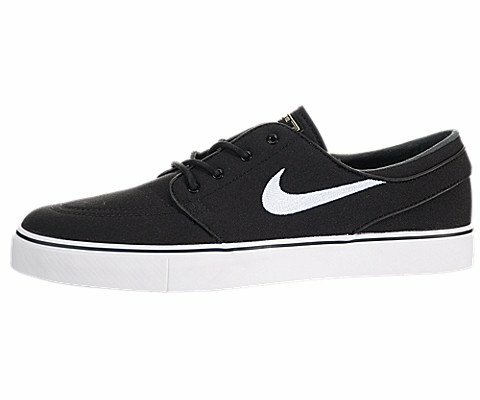 This is a classic skate shoe with a streamlined look that has made it popular as an all-around choice. The padding at the heel and tongue keep it comfortable, but it’s got a slimmer profile than something like the Etnies line, which allows it to keep a lot more flexibility while you ride. You can’t beat the brand for quality and recognition, but be aware that many riders find this shoe pretty narrow. The shoe is made from canvas similar to a classic Chuck Taylor, so don’t expect it to be particularly waterproof, either. 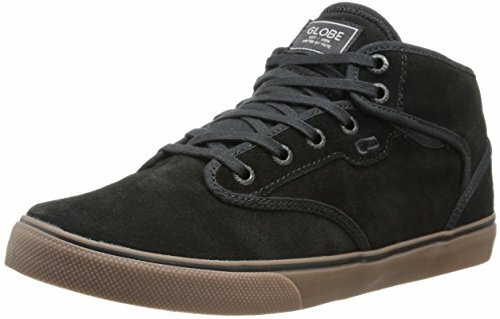 Another classic skate shoe with a sleeker design for a modern buyer, the Globe Motley Mid stands out from this crowd for offering a bit more ankle support. Other than this one feature, it also has the brand’s standard slip-resistant lining and a few features that make the shoe more durable – like metal eyelets and heavy-duty stitching. One issue that we had with this particular shoe was a lack of padding around the heel and tongue, which made it a little less comfortable than other options. 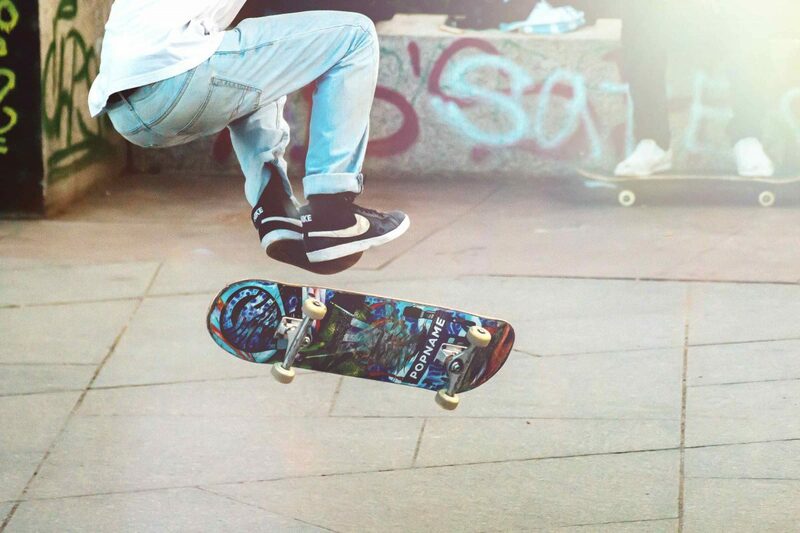 The Adidas Originals Seeley stands out for one reason: superior board control. These are the grippiest shoes we reviewed, with a vulcanized rubber outsole that will not stop. Otherwise, this shoe offers a pretty basic, but solid, construction. Simple low-top sleekness, minimal padding, and only a small amount of support could make these shoes less comfortable to some – but they are lightweight and easy to wear in other contexts as well. 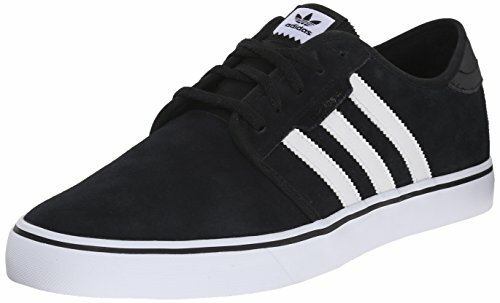 They also come in a range of colors, and all feature that classic three-stripe logo that makes Adidas instantly stylish. Offering skaters a different sort of aesthetic style from a lot of the boat shoe styles out there right now, the Vans Sk8-Hi is a little more spunky and youthful looking. 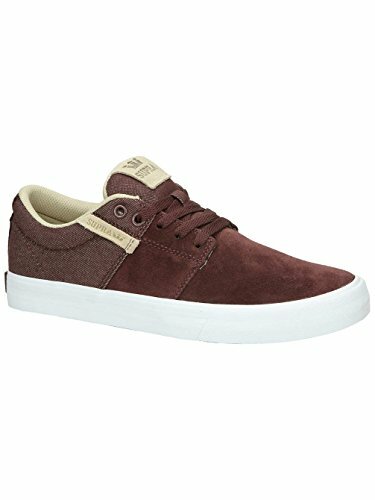 It’s also made of durable suede that can withstand a bit of damp and has Vans’ signature waffle sole that makes it nice and grippy. Depending on what your feet are like, you may find the non-supportive insoles and narrower design to be more comfortable – but those with wide feet and high arches, beware. Obviously, this shoe is backed by an industry standard name, so the quality is surprisingly great for the price. While many skaters want a shoe that can go from the skate park to school or work, and back again, don’t let your hunt for style slow you down. 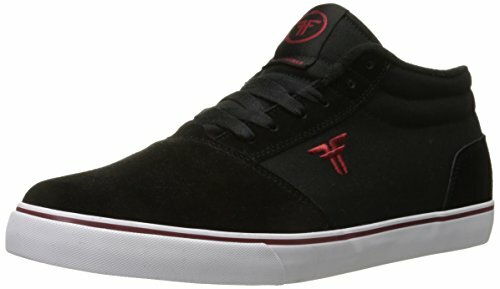 Most modern skate shoes have that slimmer profile that you want, and you can still find excellent skating features within that category. Use this guide to the best skate shoes on the market right now to help you find the shoe that will be your new go-to.